How do you create your masks? Why use leather for masks instead of paper mache or latex? Why are your masks and leather items so expensive? How do I take care of my leather mask? Do you rent your masks? I am a photographer, can I borrow your mask for a photo shoot? 1. How do you create your masks? 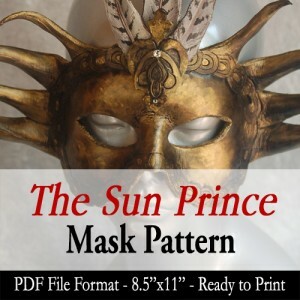 My masks are created using vegetable tanned leather cowhide. I use specialized tools to carve and tool the leather (you can see a list of my tools here). Color is added with various Acrylic paints ranging from matte to iridescent finishes. The creation is then sealed with varnish for protection and preservation. You can watch a video of my mask-making process here and read more about my other methods at my Artisan Crafts blog. 2. Why use leather for masks instead of paper mache or latex? Leather is an excellent material for masks because it is a breathable material which does not cause you to sweat as much as other materials. The warmth of a wearer’s face causes the mask to conform to the wearer’s face over time, making it a comfortable fit the more it is worn. Leather is also hardy and not delicate. You won’t have to worry about it breaking or tearing and it can last a lifetime, if taken care of properly (see my care instructions). 3. Why are your masks and leather items so expensive? Masks and leather items require specialized tools and materials which you can read about here. Each design was pulled from my imagination and translated into a unique leather item carved and painted by my hand. You are not purchasing a cheap plastic item, but a one of a kind work of art which you can wear or display on your wall. Even though I do create more than one of some of my designs, each one is unique due to the individual nature of the carving and painting process. All items are signed and dated, making each one a collectible. 4. How do I take care of my leather mask? – Store masks in a dry place out of the sun with backing to hold its shape. Hat and shoe boxes with tissue paper for backing make for great recycled storage containers. Styrofoam heads (like the ones you get for wigs) would be even better! – Not wearing it often? Frame it in a shadow box for a piece of unique art for your wall! – DO NOT bend it too out of shape or you could break the shape and crack the paint and sealant. – DO NOT wear it in a downpour, as this could compromise the shape and finish. A light drizzle should be fine, but keep it from being soaked or dunked in water. I do accept Wholesale orders. However, due to the nature of my handmade items and the fact I am a one person studio, I can only offer a bulk discount up to a certain point. A dedicated site for wholesale orders is in construction. Until that time, please email me directly for wholesale inquiries. 6. Do you rent your masks? For the most part, the answer is no. However, if you are a photographer who would like to trade me product shots of my masks for photos to add to your portfolio, read on here for details! I am open to collaboration of this nature involving the loaning of my masks for photo shoots. 7. I am a photographer, can I borrow your mask for a photo shoot? The answer is usually yes! I am open to loaning my masks for photo shoots in exchange for product photos for me to use. Read on here for details. 8. Do you accept custom orders? The short answer is yes! I will review custom requests and approve or deny them based on my schedule and interest in your project. Read on at Commission for more details.